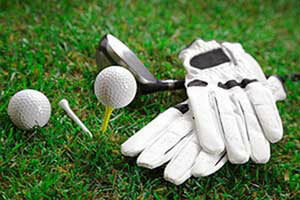 Green everywhere on the golf course so why on in your golf bag also? 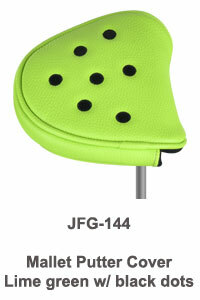 Included in this Green with Envy collection are our lime green dots driver, fairway wood and hybrid headcovers. 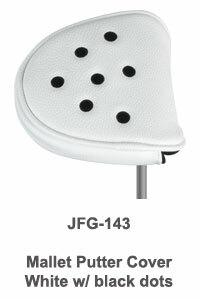 We have black and white dots headcovers too! The size of the dots are coordinated with the club cover size. Large dots on the driver, medium on the fairway wood and reversed colours small dots on the hybrid covers. Prefer stripes? 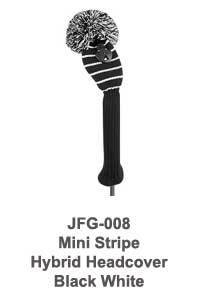 There are black and white striped headcovers in this collection also. 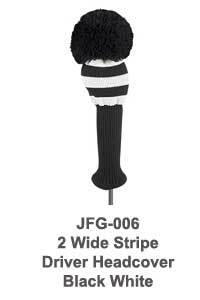 All our knit golf club headcovers have a coordinating solid coloured oversized pompom. 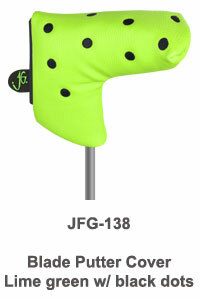 Lime green headcover with black dot pattern. 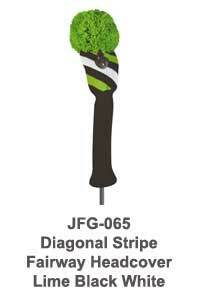 Lime green/black/white striped fairway wood and hybrid headcovers. 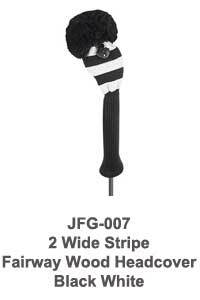 Coordinating black and white striped or dot driver, fairway wood and hybrid headcovers available. 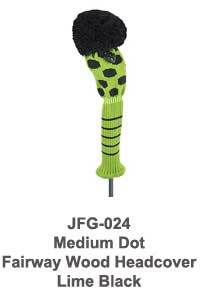 Matching putter headcovers in black with lime green dots or silver with black dots. These golf headcovers are knit just like your favourite sweater Grandma made for you. Better fitting to your club by the use of Spandex. Double layer intarsia construction at the club head. 2 x 2 rib shaft to protect golf club shaft. Coordinating oversized pom pom on each golf club cover. Unique size marker to mark your clubs included with the fairway wood and hybrid headcovers 3,4,5,7,X. Mallet and blade putter covers. 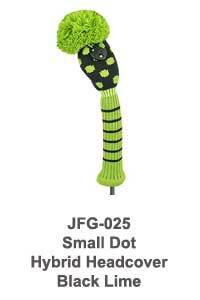 Choose from lime green driver headcover with black dot pattern and lime green pom pom or black driver headcover with black and white striped pattern and black pom pom. 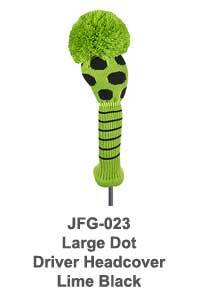 w/ large lime green pom pom. w/ large black pom pom. 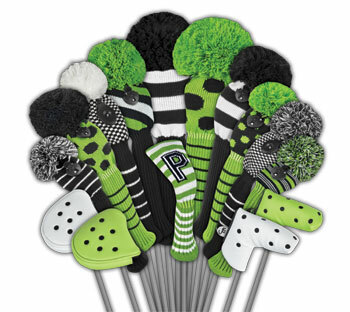 Choices include: Lime green fairway wood headcover with medium black dot pattern and pom pom, diagonal black/lime green/white stripes with lime green pom pom or black and white wide stripe pattern with black pom pom. w/ lime green pom pom. The hybrid headcovers in this collection come with a choice of lime green pom pom and shaft with black head and small lime green dots, lime green/black/white mini stripes with matching variegated pom pom and black with small white stripe and black and white variegated pom pom. 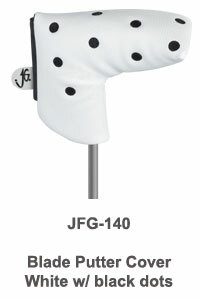 Our knit golf club headcovers are shipped from the U.S.A. and are available for shipment to Canada and U.S.A. via U.S. Postal Service. Normal Shipping Time: Order processing takes 3 business days plus shipping time. Dimensions: Fit standard sized clubs. Order processing takes 3 business days plus shipping time.